A Helicopter tour of Kauai is the best way to explore the rugged interiors of Kauai without getting your feet muddy. A thrilling helicopter ride through Kauai’s inaccessible interiors will give you a bird’s eye view of some of the World’s most hidden beauty. Fly through the colorful Waimea Canyon, the jagged cliffs and remote valleys of the Napali Coast and into the Waialeale Crater where waterfalls will surround you. Book your helicopter tour at the beginning of your Kauai vacation to get a better perspective of Kauai’s hidden interior. Sit back, relax and enjoy the views, while your experienced pilot shows you the most remote and breathtaking areas on Kauai. 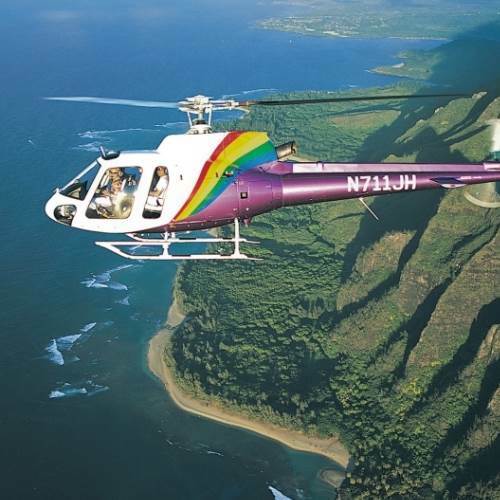 Where do Kauai Helicopter Tours Fly? The most popular tour would be an hour tour that would take you through Kauai’s lush tropical interiors of Waialelale Crater, Waimea Canyon, and along the Napali Coast with a lot of extra in between. Some companies offer a 90 minute flight that will allow more time to see Kauai’s unparalleled beauty. Where do Kauai Tour Helicopters fly from? Kauai helicopter flights leave from the Lihue Airport on the East Side, Princeville Airport on Kauai’s North Shore and Port Allen Airport on Kauai’s West Side. 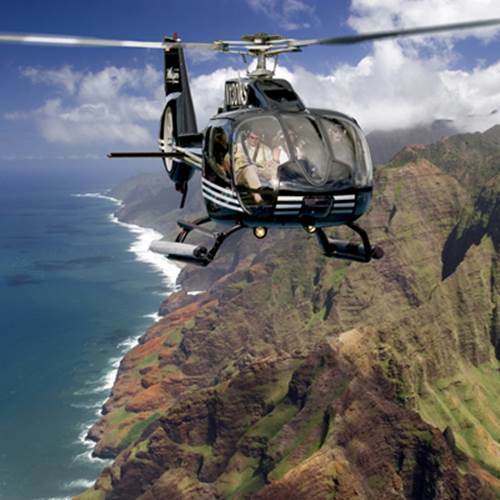 What types of helicopters are used on the Kauai Tours flights? The Robinson R44 is a fuel-efficient 4-seat helicopter. The R44 is known for excellent safety and reliability, smooth handling, and superior comfort. The spacious cockpit contains two rows of seats. The 2 by 2 seat configuration provides for one passenger seat in the front next to the pilot, and two passenger seats in the rear of the helicopter. All seats are window seats and the open cabin design allows for unobstructed viewing. The A-Star helicopters are considered the “gold standard” for Kauai helicopter flights. No matter where you sit you’ll have a nice view with 180-degree visibility. The design of the A-Star has nothing blocking your view forward. The back seat is raised to give a better view above the passengers in the in front. The Hughes 500 seats four passengers is a smaller craft known for its agility and speed. The Eco-Star is known as the luxury version of the A-Star and is generally considered the “Cadillac” of the Kauai touring helicopters. These helicopters are wider and have roomy and comfortable seating. They have larger windows and they are quieter. What does a helicopter tour cost? Flight times range from 45 minutes to deluxe tours that are an hour and a half. Prices are dependent on company and packages. Prices start at $250 and up.